 Effective immediately, GSUSA will purchase GreenPalm certificates to support the sustainable production of palm oil. The certificates offer a premium price to palm oil producers who are operating within the guidelines for social and environmental responsibility set by the Roundtable for Sustainable Palm Oil.  GSUSA has committed to working with our licensed bakers in plans to join other industry leaders in making a pledge to move to a segregated, certified sustainable palm oil source by 2015, based on market availability.  GSUSA will work to build a coalition of respected environmental organizations that support sustainable palm oil and to carry that message to industry leaders across the globe.  GSUSA will become an affiliate member of the Roundtable for Sustainable Palm Oil (RSPO), an organization of growers, buyers, manufacturers, conservationists and interested parties who are striving to develop and follow best practices to ensure sustainability.  And GSUSA has directed its bakers to use as little palm oil as possible, and only in recipes where there is no alternative. GSUSA estimates that of all the palm oil used globally, Girl Scout cookies account for less than one-one-hundredth of one percent (.001%). 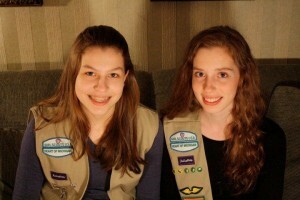 This action follows a five-year campaign by two teenage Girl Scouts from Michigan to make Girl Scout cookies rainforest-safe. The girls, Madison Vorva, 16, and Rhiannon Tomtishen, 15, learned as part of their Girl Scout Bronze award project that the habitat of the orangutan is threatened by deforestation caused by palm oil production.